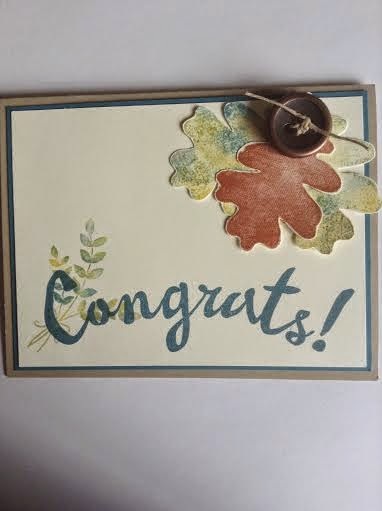 I do love the colors of fall so this card was fun to make...and to give! Yup, it's already in the hands of the recipient! I made this card for my son to give at an "I Do BBQ" for some friends who are getting married the end of this month. You should have seen the invitation! So cute!!! Don't forget to leave a comment on yesterday's post HERE for a chance to win a set of 4 Fall cards handmade by Moi! Labels: Baby Wipe Technique, Bravo, For All Things, Stampin' Up! I think that's the first time I've heard of the baby wipe technique. I need to try that technique... Sounds fun! It was fun! I will be teaching it to my stamping group on Wednesday.